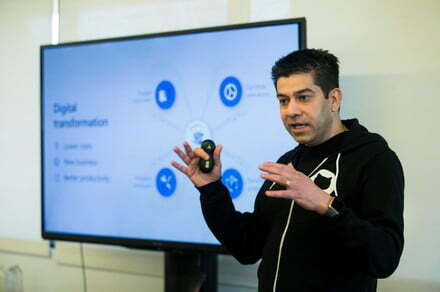 Recently, we visited the Microsoft Campus to learn about the new updates to Azure and its new capabilities of artificial intelligence, made for developers and scientific data. With these new capabilities, the range of solutions becomes more accessible for businesses and entrepreneurs. Now the service in Azure can detect images, analyse them, classify them and exploit them, according to the needs of any company. A clear example is Minsur SA, a peruvian company of mining that applies ‘Custom Vision’ with the aim of creating a practice of sustainable mining to ensure that the water used in the process of extraction of minerals is treated properly for reuse in agriculture and livestock. This is achieved by the detection of levels of foam treatment. Used a combination of analytical video of ‘Custom Vision’ and Azure to replace a highly manual and inefficient with the goal that employees can focus on more strategic projects within the operation. Another of the new artificial intelligence applications is the detection of anomalies, this feature is a kind of prediction that there is something out of the ordinary. A clear example is the credit card fraud, a common practice in the society of today. Today, more than 200 machines in Azure and other main products of Microsoft rely on the ‘Anomaly Detector’ to increase the reliability of their systems to detect irregularities in real time and accelerate the solution of problems. Developers can easily integrate the capabilities of detection of anomalies in their applications to ensure a high precision of the data and address automatically the incidents as soon as they occur. The case scenarios of common uses include the identification of incidents to business and text errors, the traffic monitoring devices of the Internet of Things, fraud detection, the response to changes in the markets and more. If you are a Microsoft user, you will know that the company from Redmond is using the artificial intelligence in all of their products and their platforms. The above is just an example of things that are not very visible to us, but somehow improve our lives and our environment every day.